Charleston South Carolina, the 2nd largest destination wedding in the country, and one of the reasons why, is because of the history of this great city that date from the 1700 to the 1800 period. The buildings and the churches, synagogues, cobblestone street are all part of this rich history. Take the history of this church in particular. 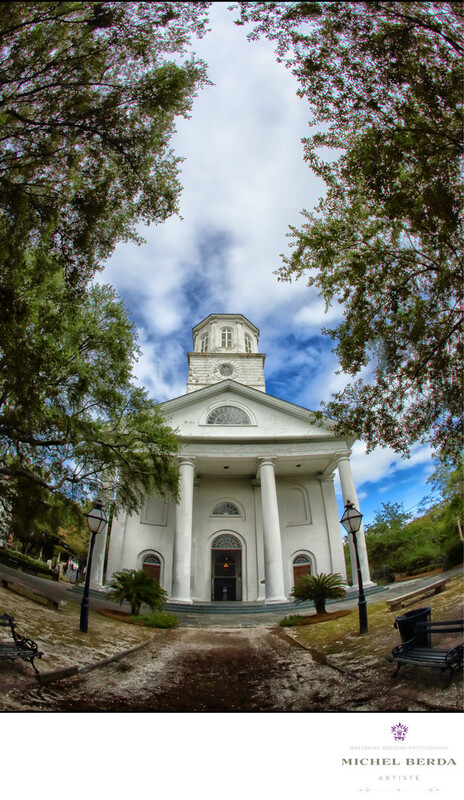 Fifteen men began planning the Second Presbyterian Church in 1809, and to accommodate the growing congregation at First (Scots) Presbyterian Church on lower Meeting Street in 1811 this new church was built at 342 meeting St. Charleston South Carolina. It is well preserved , and has amazing window light. I have seen many photographs taken of this church, I captured it a little different by using a fisheye lens to incorporate the trees and the feel on how big and beautiful this church is, and by adding some artistic touches in pre post production, I love the blue sky, the green rustic look the benches, and art of the image that resulted in this beautiful image captured in Charleston, Sc. Keywords: Charleston (1179), charleston south carolina (9), Meeting Street (3), SC Wedding Photographers (3), The Second Presbyterian Church (3), Wedding Photographer (1254), Weddings (168), Weddings Church (3).